�NS Environment has revised the on-site sewage submission checklists for system design and selection, and the malfunction inspection assessment form. The revised forms will be required effective June 19, 2015 and can be downloaded from the Resource section on the Home page of the WWNS website. The Environmental Home Assessment Program (EHAP), which provided funding for homeowner education, vouchers to encourage septic tank pumping and grants for low income homeowners to make repairs to their septic systems did not receive funding in the latest provincial budget. Any septic repair grant clients from the last fiscal year that were "accepted" for the grant but unable to get the work done yet, will still be honored but there will be no new grants provided. Orenco's Advantex AX20-RT, AX25-RT and AX100 advanced wastewater treatment systems have been approved for use in on-site sewage systems in Nova Scotia. The pre-treatment offer by these systems could be of benefit on small lots, malfunctions, etc. Advantex Systems require a QPI design and must include subsurface disposal, unless otherwise approved by Nova Scotia Environment when replacing a malfunctioning system. For more information contact Ken Reardon or Michele Hastie at Atlantic Purification Systems (APS) at 902-469-2806 or email kenreardon@aps.ns.ca. Also, you can access their website through the link in the "Resources" section. Starting May 14,2012, you may visit https://www.gov.ns.ca/nse/cmsapp/ to renew applications, submit new applications and submit payments for certifications online. Within the sixty days prior to the certification expiration, eligible applicants can update their personal information, submit information for renewal, and submit a payment for certification with a credit card. As was presented by Gary Giles of the Compliance Safety Institute during the WWNS AGM; the Department of Transportation and Infrastructure Renewal advised that new provincial Commercial Drivers� Hours of Service Regulations have been approved, and they will apply to all motor carriers and drivers operating within Nova Scotia. The new regulations are almost the same as the federal regulations which have been in effect since January 1, 2007. Comparing to the previous provincial rules, the maximum daily on-duty time has been reduced from 15 hours to 14 hours. A maximum daily work shift has been set at 16 hours. The minimum daily off-duty time has been increased from 8 hours to 10 hours. The number of work cycles has been reduced from 3 to 2. Log books will continue to be required for those traveling outside a 160km radius of their home terminal, and records for the previous 14 days will need to be kept in the vehicle. A �commercial vehicle� is a truck, truck-tractor or trailer, or any combination of the two, that exceeds a registered gross vehicle weight of 4500 kg, or a bus that is designed and constructed to have a designated seating capacity of more than 10 persons, including the driver, and is used for transporting passengers for compensation. For local operations, within 160 km radius of home base and returning home at the end of each day, the amount of record keeping required for the federal regulations has been reduced in the provincial rules. The local driver will only be required to keep track of working time and not the specific times when the driver has been driving or doing other work. The maximum daily on-duty time will remain at 14 hours and the minimum daily off-duty time will remain at 10 hours. Daily driving time will be limited by the maximum daily on-duty time. The recording of working time does not have to be in a log book, but it must be readable and understandable. These records must be kept in the vehicle for the previous 7 days. Pre-trip Vehicle inspections are required and the driver of the vehicle is required to carry a record of the inspections and provide these records to an inspector when requested. The carrier is the person who owns, leases or is otherwise responsible for the operation of a commercial vehicle. No motor carrier shall permit and no person shall drive a commercial vehicle on a highway unless that person is in possession of the required inspection report(s). Note: The complete regulation is contained within the National Safety Code standard 9, hours of service, or standard 13, Daily Pre Trip Inspection. The Province of Nova Scotia has released a new Wetland Policy to the public. A link to the policy and other information about wetlands in Nova Scotia is available on the Nova Scotia Environment website at http://www.gov.ns.ca/nse/wetland/. Nova Scotian on-site sewage Installers are now able to use processed tire shreds in the construction of leach fields for residential onsite wastewater treatment systems. Tire-derived aggregate (TDA) is a newly available construction material now produced locally from recycled vehicle tires. TDA has been approved as an alternative to stone aggregate in leach fields in Nova Scotia since 2009. Approved TDA material is now available as of July, 2011. To date, Halifax C&D Recycling in Goodwood, Nova Scotia is the sole supplier of TDA in Nova Scotia. They can be reached at: (902) 876-8644 or http://www.halifaxcdrecycling.ca. Material can be obtained directly from the supplier or though your local septic system installer. The approval process is the same for systems using TDA as for those using stone aggregate. The presence of some protruding wire in TDA requires that installers take basic construction safety precautions such as use of protective shoes and gloves, and remove excess material from the site through the use of magnetic nail sweepers or rakes. Each septic installer, septic tank cleaner, portable restroom operator or QP11 must collect 100 professional development points over a four year period in order to remain qualified to be licensed. A revision(Appendix A) to the manual "Selection an Installation Manual for Quick4 Chambers in Nova Scotia" has been approved by NSE. This will allow for the use of 2 inch pipe with 1/4 inch drilled holes to be used for distribution in pressurized systems using the Infiltrator Chambers. For a copy of this manual, contact your local Infiltrator distributor. QPII's (Qualified Persons II) considering retirement should be aware that Tail End Insurance is now available at a reduced rate. For more information, contact Your insurance provider or the office of WWNS. Nova Scotia Environment have approved increasing the loading rate of Brookfield Concrete's Peat Module units to 250 litres per day. In that background, and subject to 'system design', home owners may now be able to get away with using four modules for up to a three bedroom home (1000L per day) and six modules for a four bedroom home (1500L per day). For further information on Brookfield's amended approval, contact Earl Morgan at Brookfield Concrete (902)673-2225 or Nova Scotia Environment (902)424-7773. Nova Scotia Environment keeps a listing of persons licensed to operate in Nova Scotia. The listings include, among others, Qualified Persons, Septic Installers, Septic Pumpers and Portable Restroom Operators. You may find these listings on the NSE website at www.gov.ns.ca/nse/resources/license.certification.listings.asp. Please note that individuals are listed by county but their area of coverage may included multiple counties. It has been brought to our attention that, should you be considering designing/selecting an on-site sewage system which will be encroaching on a NS Power easement, you must seek the approval of NS Power before proceeding. As we understand it, when NS Power allows an on-site system to be constructed on their easement, there is a $1000.00 +HST administration fee for them to visit the site and register documents on the property deed. As of March 27, 2009 Infiltrator Quick 4 Chambers have been approved for use in the selection or design of on-site sewage systems in NS. Should you wish to use the Infiltrator Chambers you will have to refer to Infiltrator's "Selection and Installation Manual" when processing your on-site sewage application. For additional information on the Infiltrator Chambers, we suggest you contact your local NSE office, or Don Krauss of Infiltrator Systems at 888-275-1238 (toll free) or 705-845-1443 (cell). 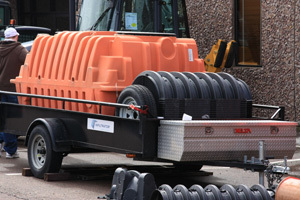 Picture: Septic tank and Infiltrator Quick 4 Chambers on a trailer for transport. Premier Tech Environment and The Shaw Group are pleased to announce that the Ecoflo treatment system is approved for use in Nova Scotia. The Ecoflo is a peat module system for domestic wastewater treatment for residential and community applications. The Ecoflo system has a proven history and to date there are in excess of 40,000 installations in Canada and the United States. The Ecoflo is a lightweight module that occupies a small footprint on the property, and in most cases, only one module is required. The Ecoflo system is stocked at the GS Concrete facility in Windsor, Nova Scotia. For more information on the Ecoflo system, please visit the Premier Tech Environment website at www.ptenv.com or the GS Concrete website at www.gsconcrete.ca. You may also contact the GS Concrete office at 1-800-565-7000 or Alden Faulkner at 1-902-790-0623. A new Micro-Modular Peat Filter System, designed and produced by Brookfield concrete Products Ltd., has received approval by NS Environment for use in Nova Scotia as an on-site sewage disposal system. The new �lightweight� peat filters were subjected to an extensive testing program administered for Brookfield Concrete Products Ltd. by the Centre for Water Resources Studies and the Department of Process Engineering and Applied Science at Dalhousie University. It is also presumed to have been the first study in the province in which the treatment efficiency of a peat filter exposed to different loading rates was assessed. The testing and monitoring project was carried out at the Nova Scotia On-Site Wastewater Research, Evaluation, and Training Facility, located at the Bio-Environmental Engineering Centre (BEEC) in Bible Hill, NS. For information on this new, innovative system, you can contact Brookfield Concrete Products Ltd. at 1-866-705-2225 (toll free), or 902-673-2225. Earl Morgan, Brookfield Concrete Products Ltd.
Notice QP1's & QP11's: Nova Scotia Environment has launched a new civic address verification system. When they receive an application and the information from Section 3 of the application form is entered into their information system, the civic address is verified. If the system determines that the address is "not valid", the application is considered "incomplete." At that point an "incomplete" letter is sent out to the applicant/contact person to verify the site information in accordance with the Nova Scotia Geomatics Centre, Civic Address Viewer (Property On-Line). Until such information is supplied in writing, the application will not be processed. To help prevent any delays with submitted applications, please ensure addresses in Section 3 of the application forms are in accordance with what is recorded by Property On-Line. Note: The most common error is an incorrect community name for a given PID, so please check for validity. Should you require further clarification with respect to the foregoing, contact your local Dept. of Environment Office. Requirement of On-Site Sewage Installers, Septic Pumpers, Portable Washroom Operators, Septic Bed Cleaners to Carry Contractors' General Liability Insurance (CGL). The Dept. of Environment requires the above groups to carry CGL Insurance and/or to be covered by the company for which they work. It was originally intended that any employee working for a company had to be listed on their employer's insurance policy before they would be offered a certification. This has created a problem as the insurance companies are telling the employers, "If your employee moonlights using their certification, i.e. pumps septic tanks, installs septic beds, etc., technically they are covered under the employer's CGL policy. Or, worse still, if your employee left your employ, went to another company and you did not remove him/her from your insurance policy, then they could still install septic systems, pump septic tanks, etc, as they are still insured under your policy." As all CGL insurance policies cover employees "for acts within the scope of their employment", the Dept. of Environment will now accept applications for certification from individuals provided they provide a copy of the company's CGL policy, and a letter from a company official confirming the person applying for certification works for that company. While the Dept. of Environment will still accept applications for certification with an employee listed on the employer's insurance policy, I do not recommend you follow this practice as it puts your company at risk. I recommend you provide a copy of the company CGL policy, with an attached list of employees covered. In this way, the employee has insurance coverage only while working for you. Any work they do outside the scope of your employment is at their own risk. Background: The Regional Plan includes new requirements for watercourse buffers relative to adjacent developement. The minimum buffer width is 20 meters. Where average slopes within the buffer exceed 20%, it is widened by 1 additional metre for every 2% increase in slope to a maximum width of 60 metres. Retaining riparian buffers around watercourses and along the coastline is important for the protection of water quality, and the wildlife protection of property from natural hazards of flooding. To maximize the protection benefits of riparian buffers, trees, shrubs, ground cover vegetation and soils must be protected. To that end, excavation, infilling, tree, stump and other vegetation removal or alteration within the buffer is prohibited. Grandfathering Principle: To provide for the reasonable developement of "existing" lots that were designed to meet requirements in effect prior to the enactment of the water course buffer provisions.Further, where substantial design work and costs have been incurred in laying out on-site sewage disposal systems for existing lots, it is not the intention of HRM to disregard this work and request a re-design for the sole purpose of accommodating the watercourse buffer.